I have been wanting to try Coi for some time and I finally got the opportunity to go with my good friend, JM. The name of the restaurant itself, Coi, a French word meaning 'tranquil' is an apt name which best describes the small, yet elegant space with its serene and rather subdued interiors with a muted color palette and grasscloth walls. 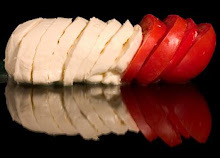 Chef and Owner, Daniel Patterson is a known for his adventurous techniques and masterful execution of dishes that often incorporate molecular gastronomy. Some examples of these would be foams, emulsions, gels, essences, aromas and the use of essential oils with food of which he has written a book about and is known for. These techniques, which are not unlike that you would see from Ferran Adria's El Bulli in Roses, Spain and Grant Achatz at Alinea in Chicago, which are extremely cutting edge, whereas Patterson is much more subtle, perhaps more towards the style of the veritable Thomas Keller of French Laundry. Coi received four stars from Michael Bauer of the Chronicle this past August, a rating shared by only a precious few of the veritable Bay Area chefs such as Thomas Keller of the French Laundry, Roland Passot of La Folie, Ron Siegel of the Dining Room at the Ritz and Michael Mina to name a few. Patterson's style of food is highly unique and individual with a depth and artistic quality that is rivaled by no other in San Francisco. As Frank Bruni of the NY Times stated, Patterson's food is likened to art, religion and Chanel No. 5. So enough with the background, let's move on to the important part - the Food. And if the photos are anything to go by, each Dish was rather unique and beautiful. Milk encased somehow within the Honey. Next to the Dish itself was a small dab of essential oils - we were instructed to dab some on our wrists and inhale deeply before eating. This is COI's signature fragrance, and it was interesting to say the least. Fourth Course was a choice between this on and the Bone Marrow Dish below. Fifth Course was a choice between this Dish and the Spiny Lobster below. Seventh Course we both were given the MATSUTAKE GRILLED ON THE PLANCHA potato-pine needle puree. Nice Dish. green farro, gold chard, brown butter-parmesan sauce. The last few Courses were Dessert Dishes. First a QUINCE PARFAIT huckleberry, almond, thyme. cocoa nib, violet ice cream. The Milkshake above, as unassuming and simple as it sounds, was a real winner, which came as a huge surprise. I mean, I'm talking 'eyes rolling back' kinda good. A truly fantastic end to an amazing dinner. JM and I agreed that the other winners were the Abalone and the Bison. 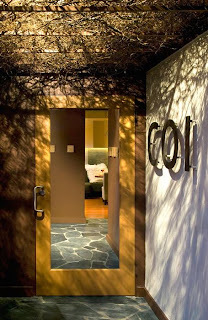 Coi was a truly memorable experience which we found to be truly innovative and each Dish, meticulous in its presentation and attention to detail and in its use of local organic ingredients. 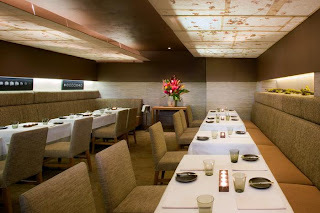 And just an FYI, the Tasting at Coi consists of an 11 Courses at $120 per person, so be sure to save up beforehand. Thanks again, JM for dining with me, and as I said, next food review will be my treat!